“Now that you have your amateur radio licence and have gained experience operating, it may be time for you to move on to an Intermediate Licence. 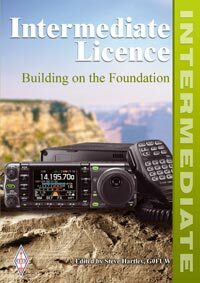 The Intermediate Licence carries with it more privileges and also more responsibilities on you as a radio amateur. On obtaining your book, you should check for corrections, updates and additional information. The Intermediate exam consists of a practical assessment, which must be signed off by an RSGB Registered Assessor, and an examination which consists of 45 multiple choice questions (4 answers) and lasts for 85 minutes. The practical assessment must be completed before the exam can be taken.